Former inductees include agricultural history-makers such as Tommy Irvin, Georgia’s former commissioner of agriculture; D.W. Brooks, founder of Gold Kist, Inc. and Cotton States Mutual Insurance Companies; J.W. Fanning, former UGA vice president for public service; and J. Phil Campbell Sr., founding director of the Cooperative Extension Service in Georgia. 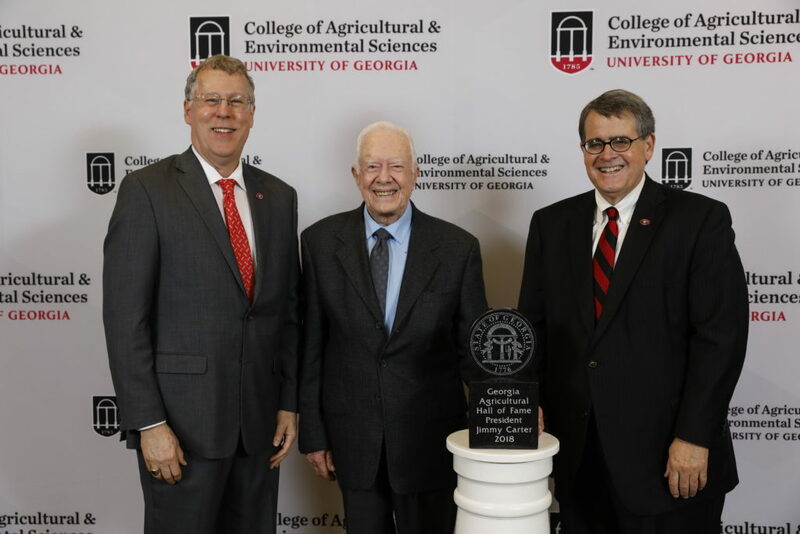 UGA College of Agricultural and Environmental Sciences Dean Sam Pardue and university President Jere Morehead congratulate former President of the United States Jimmy Carter before his induction into the Georgia Agricultural Hall of Fame. Carter’s agricultural background helped shape his public service ethic and drove him to help people, said Abit Massey, former head of the Georgia Poultry Federation and a friend of Carter’s. Having Carter run for statewide office and then his national post made the nation take notice of what was happening in rural Georgia. This year, recipients of CAES Alumni Awards of Excellence included Donya Lester (BSA 1981), executive director of the Purdue Agricultural Alumni Association; Krishna Paudel (PHD 1999), professor and environmental economist at Louisiana State University; Calvin Perry (BSAE 1986, MS 1988), superintendent of the University of Georgia’s C.M. Stripling Irrigation Research Park and Jody Strickland (BSAE 1986), executive vice president of forest operations and real estate services for F&W Forest Products. For more information about the CAES Alumni Association visit caes.uga.edu/alumni.